Stephen Hopkins, Jamestown Settler, Mayflower Pilgrim – and Shakespeare Character? Stephen Hopkins settled both Jamestown and Plymouth, and many believe Shakespeare based a character on him. Though he wasn’t among the first Jamestown settlers, he did arrive within the first three years. He might have gotten there sooner but for a shipwreck – a shipwreck that probably inspired Shakespeare to write The Tempest. 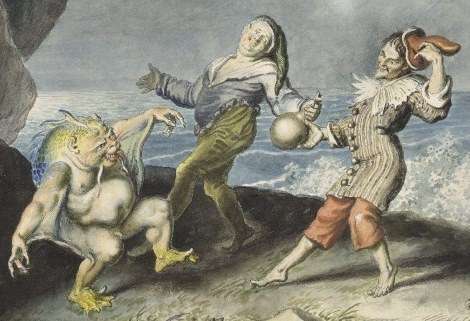 Shakespeare portrayed him as a drunken clown with ambitions of grandeur. In real life, Stephen Hopkins narrowly avoided execution for mutiny and later ran into trouble with the Plymouth authorities for overserving the patrons of his tavern. Stephen Hopkins was born in 1581 in Hampshire, England. By 1604, when he'd reached his mid-20s, he lived in Hursley, Hampshire; he had married Mary Kent. They lived with her widowed mother, Joan Kent, and kept a small alehouse in Hampshire. Hopkins' mother-in-law apparently liked to sample the product. In 1605, Joan Kent was charged with being acommon tippler and fined four pence. By 1608, Mary and Stephen Hopkins had three children: Elizabeth, Giles and Constance. In 1609, Stephen Hopkins got a job as a minister's clerk, probably to help support his growing family. In his new job, he read religious works to a congregation that included members of the Virginia Company. Then that same year, Stephen Hopkins signed up as a three-year indentured servant bound for North America. He left for Jamestown on the Sea Venture, a 300-ton flagship leading seven other ships in a flotilla. The Sea Venture carried supplies, settlers and the new governor, Sir Thomas Gates, to Jamestown. Two months into the voyage, a hurricane separated the Sea Venture from the rest of the flotilla. Lashed by the storm for three days, the Sea Venture began to leak badly. Seawater reached nine feet in the hold when land -- Bermuda -- was sighted. The ship ran aground and all 150 people aboard made it safely to land. The castaways quickly discovered they’d landed in paradise, and they lived on the island’s fresh water, pigs, turtles and birds. Nearly all of them survived for nine months in Bermuda. While there, they built two small ships from Bermuda cedar and parts salvaged from the Sea Venture. On May 10, 1610, Stephen Hopkins and the surviving castaways set sail for Jamestown. Eleven days later, they arrived in Virginia. A report of the shipwreck reached England, as did tales of the castaways. In November 1611, Shakespeare’s play The Tempest first appeared on the English stage. In a comic subplot, the drunken power-hungry butler named Stephano tries to depose the island’s ruler, Prospero. Many scholars believe the Sea Venture's wreck inspired Shakespeare’s play The Tempest. 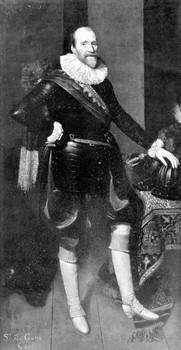 Many also think Stephen Hopkins inspired Stephano because of an incident on Bermuda. As the castaways labored to build their boats, Stephen Hopkins started questioning the authority of the group's governor, Sir Thomas Gates. He argued they should sail to England, not Jamestown. Gates had him arrested and charged with mutiny. Hopkins was found guilty and sentenced to death. But he pleaded for his life with 'sorrow and tears,' and so many castaways begged mercy for him he received a pardon. From then on, Stephen Hopkins wisely avoided controversy. Back in England, Mary Hopkins supported herself and her three children partly by working as a shopkeeper. Some of Stephen’s wages were also sent to her. In 1613, Mary Hopkins died suddenly. News of her death came by letter to Stephen Hopkins in Jamestown. Soon after he returned to England to take care of his children. Living in London, Stephen Hopkins married again, to Elizabeth Fisher, and they had a daughter, Damaris. The Pilgrims recruited Hopkins as a Londoner, or Stranger, to help with the voyage. In September 1620, Hopkins, his children, his pregnant wife and two servants boarded the Mayflower. During the terrible voyage, Elizabeth gave birth to their son, Oceanus, the only child born aboard the vessel. On Nov. 9, 1620 (O.S. ), the Mayflower lay at anchor off the coast of Provincetown when Stephen Hopkins and 40 other men signed the Mayflower Compact. In Plymouth, Stephen Hopkins proved useful for his knowledge of the American Indians, gained during his stay in Jamestown. When Samoset first approached the settlers, he spent the night in Stephen Hopkins’ house. The entire Hopkins household survived that first grim winter, only one of four in Plymouth to escape death. Stephen and Elizabeth had five more children and they ran a tavern. By 1630, he began to get into trouble with the Puritan authorities. The court fined him for allowing drinking and shuffleboard on Sunday, for overcharging his customers and for letting his customers get drunk. The court also committed him to custody for refusing to support a servant who gave birth out of wedlock. Stephen Hopkins died in 1644. In his will he asked to be buried next to his wife, and left his possessions to his surviving children. This story was updated in 2018. If you enjoyed it, you may also want to read about the Pilgrims' free-thinking neighbors in Merrymount (now Quincy, Mass.) here. Both my husband and I are direct descendants of Stephen Hopkins: me through his son Giles and my husband through Constanta (what she was called). I would like citations as well. Thanks! I am a direct descendant of Stephen Hopkins who signed the Declaration of Independence. It seems likely that he is a descendant of Stephen Hopkins, a passenger on the Mayflower, but I can find no documentation to that effect. I assume others may have the same ancestry question. If anyone has established a ling between the two, please let me know.